The CCM High School National Invitational Tournament (NIT) is annually one of the top showcase tournaments in the country. The tournament features teams comprised of the top high school players across the country including those from Minnesota, Massachusetts, Michigan, North Dakota and Wisconsin. 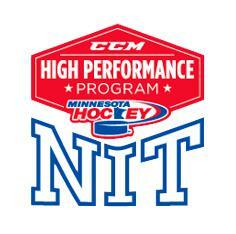 The 2018 CCM Boys NIT will be held on April 19-22 at Plymouth Ice Center in Plymouth, MN. Two boys’ teams from Minnesota will compete in the tournament. The Minnesota Seniors and Minnesota HP 18 boys’ teams will be comprised of the top players from the 2018 Ted Brill Great 8 Tournament that took place March 23-25.